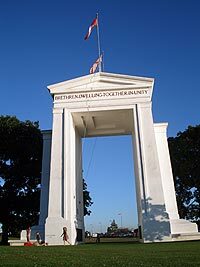 Blaine is renowned for its Peace Arch State Park at the Canadian border. This friendly seaside town features downtown shopping and an interesting waterfront right off the freeway. Blaine Harbor is proud of its modern marina and a historical boat named Plover, the oldest historic foot-ferry in the State of Washington. You can ride it weekends during the summer. Golfers are impressed by Loomis Trail Golf Course, selected by Golf Digest as one of the new top three private golf courses in America. Semiahoo Golf Course is pleased with its award-winning Arnold Palmer design course with lightening greens. Check out bird-watching tours each spring. Also, wildlife art, classes, workshops and ferry rides. In September come to the Peace Arch Dedication Day. Period costumes from the 1920s, antique cars, and a living history exhibit lure history buffs and others to Peace Arch Park. A short drive South of Blaine is a beachcomber’s paradise known as Birch Bay with miles of beach, warm wading water and a great state park. Stop for a picnic, camping or parking an RV. Birch Bay Golf Club has an executive course, waterfront dining and a lounge. A popular candy shop offers homemade candy, bakery goods and other goodies.